***Edit 2016 - Click here to view the Subway 2016 Sub of the Day/Subdays promotion. Subway has updated their Sub of the Day offer and raised prices a bit. The footlong is now $6.25 (instead ot the previous $6) and the Six-Inch $4. We've noticed Subways around us have bumped their prices up, it's not much but worth noting. F! we pay $9 at uptown Toronto! This is regular pricing on other week days - right?. Not on the day that has the discounted price for a sub. wow. 9 dollars for a sandwich. no more subway if that was the case. lots of other choices for less. I agree with you. If any sandwich's cost comes to that price, there are lots of other choices for less. 5 dollar footlong in the U.S. obv way better south of the border. Canadian dollar is actually worth around 10 cents less than the American dollar. the other way around need more canadian money cause us money is worth more !!! Ha ha ha yeah the one good thing about living in the United States of Sh*t is you get a 5$ dollar foot long, so hold on too that with pride lmao. pretty sure he means that the subway pricing in way better south of the border. and it would seem to be that way going by his price. that's what I read anyway. Five will get you ten that Head Office forced them to stop with the special deals. That's the trouble with franchises — you're never your own boss. No sub of the day in Ottawa. Subway seems to skip having specials in Ottawa that the rest of the country has. Some locations in Toronto charge more and others were slow to come up to the same pricing level as the rest. Sadly, it is still a sandwich and with so many other healthy options around, for the same price, a sub is not that economical anymore. i did however notice it is a real struggle at most Toronto locations to get a decent amount of toppings, like tomatoes or spinach, when compared to the US. Fat-based toppings are still not a problem. is sub of the day gone in Toronto. its gone at my local Scarborough/Toronto store? here in Markham, we were told last night, they no longer offer SUB OF THE DAY! Tell them thank you VERY MUCH I'll just go down the road and buy so by by now you have NO SALE TO ME ! ! ! it's gone up to $6.25 now in Toronto at most places. Pakistan, Pakistan, Pakistan..They sell fish curry subs there, thats why they are cheaper. Then now should they change the price? Just got charged $6.75 CAD for Sub of the Day in Toronto, with tax that's $7.63. I didn't notice until after I paid and left. That's robbery, the poster on the window clearly said $6. 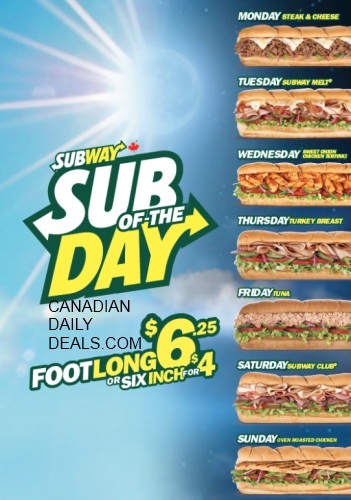 The Subway near Lakeshore and Superior in Etobicoke said the sub of the day only applies to 6 inches. I thought this was wrong, but the two people working there fought so tooth and nail I thought maybe I'm wrong. Now it appears I was right all along. Shame on them. I'll never patronize their location again and will be informing their head office about their deceitful, or just plain ignorant, practices. Subways around the GTA are ending this promotion. Such a shame, I was in there every other week getting a sub when the promotion started. Slowly they started increasing the price. When it hit $6.25 I stopped bothering until I had no other option. Now that the promotion is pretty much gutted/canceled, I don't think I'll frequent Subway anymore. I could pay the same price at Quiznos for better quality subs.